We think our list of handpicked and independently curated T-shirts are so good you’ll want to buy one either for yourself or as a gift for a friend, work colleague or relative. We’ve trawled the web and found what we think are the best science and geeky T-shirts you can buy. All of the awesome T-shirts listed below have been chosen by the people behind Gifted Geek. A great geeky gift for anyone who doesn’t like putting too much effort into their work! 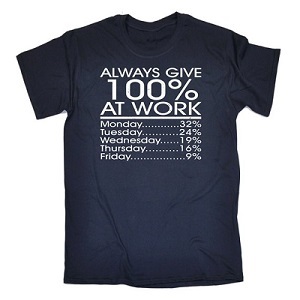 Contains the words ” Always give 100% at work” with a breakdown of how this effort should be divided throughout the week. 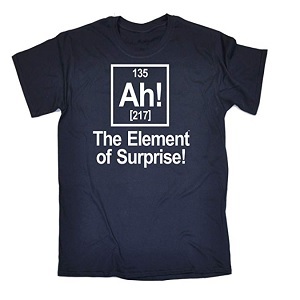 Bring a smile or two with this element of surprise T-shirt that is perfect for geeky science lovers. Made in the UK to high quality standards and gathering great reviews on Amazon, this would make a great gift. 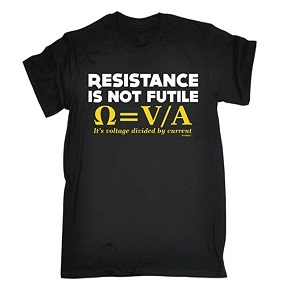 A play on the immortal Star Trek words “resistance is not futile”, this T-shirt will appeal to both trekkies and science lovers. 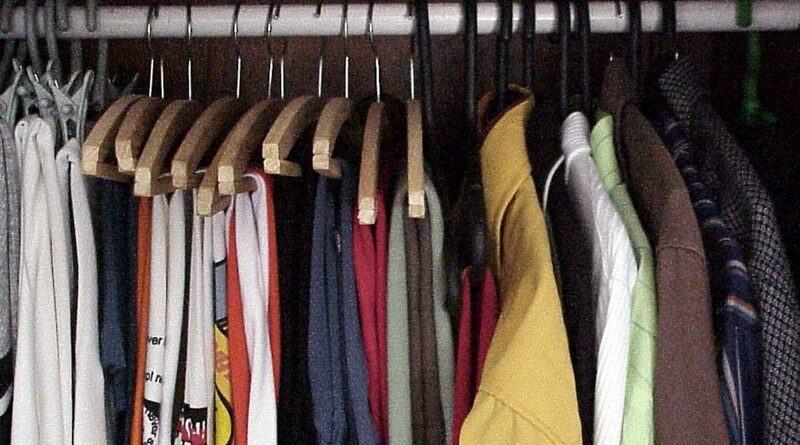 This product is available in several colours and sizes. 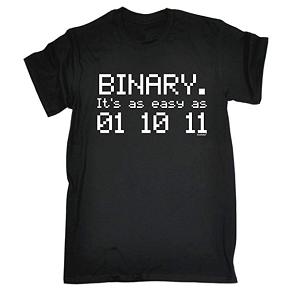 A simple explanation of the binary system printed onto a high quality T-shirt. This is perfect as a geeky science/tech gift for anyone that works with computers or tech of any kind. 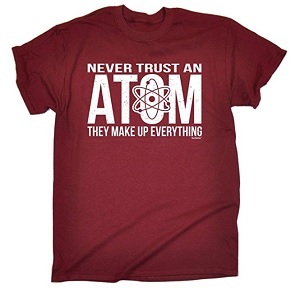 This humorous T-shirt is printed with the words “Never trust an atom, they make up everything” and is available in several colours. A perfect gift for science lovers and any geeky nerds out there. In binary to decimal “01” means one, “10” means two and “11” means three. Now you know binary, as you can see; it’s as easy as one, two, three. Available in several colours. 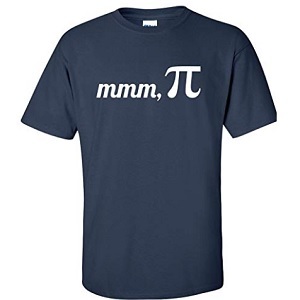 One for the mathematics geeks out there, this T-shirt which is available in several colours and sizes contains the letters mmm and the word Pi – the mathematical constant. 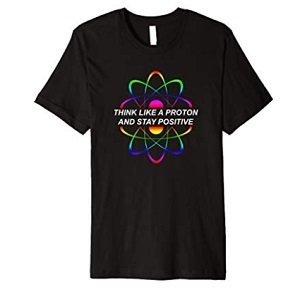 This is a colouful T-shirt and is printed with a proton logo and the words “think like a proton and stay positive. A perfect geeky gift for anyone interested in the sciences. 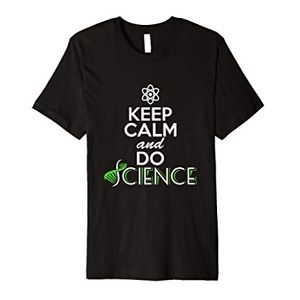 This T-shirt contains one DNA symbol and one atom symbol along with the printed words “keep calm and do science”. A popular gift for science lovers. A T-shirt for anyone interested in geology, this would make another perfect gift. 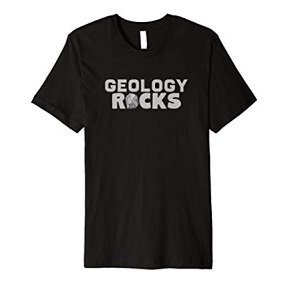 made from high quality cotton and printed with the words “geology rocks” which of course, it does. DNA makes up everything about you, including your day! 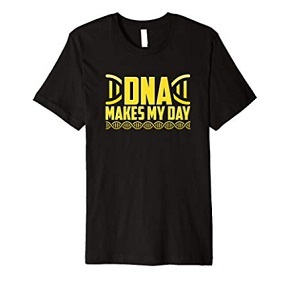 This is a colourful T-shirt printed with the DNA symbol and is available in several sizes and colours. 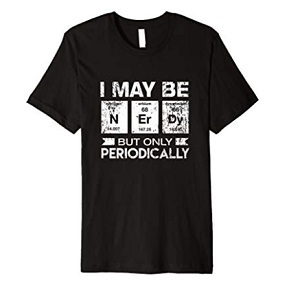 An admittedly nerdy T-shirt which displays the periodical elements to spell out the word “nerdy”. I May Be Nerdy But Only Periodically is a humourous gift for anyone interested in the sciences. Another T-shirt that uses the periodical elements to spell out a word. 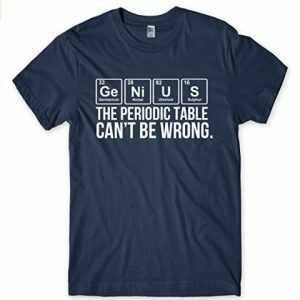 This time it’s printed with the word “genius” with the claim that “the periodic table can’t be wrong”. Another quality T-shirt manufactured in the United Kingdom. 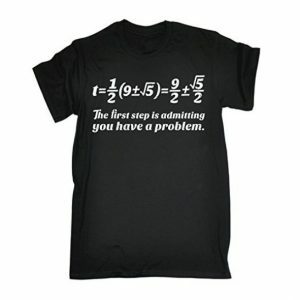 This maths T-shirt displays an equation and the words “the first step is admitting you have a problem”. Available in several colours. 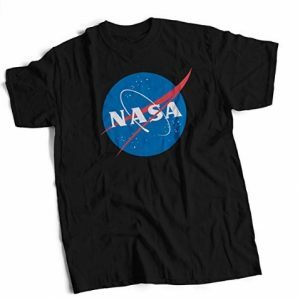 The perfect gift for space and science lovers is this coloured T-shirt displaying the Nasa “meatball” logo in blue, white and red. A popular choice of gift that is available in several base colours and sizes. Do yo know someone who has a Rubiks cube addiction? 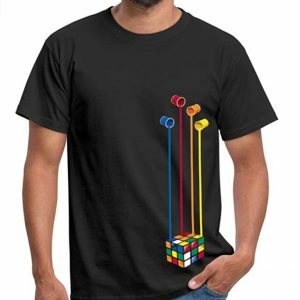 This colourful and stylish T-shirt would make a great gift. The image contains a Rubiks cube and pots of paint pouring out colours. A perfect gift for wives to buy their husbands. 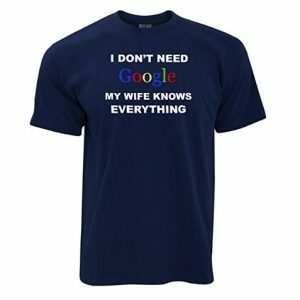 Why use Google when your wife knows everything. This colourful T-shirt contains the Google logo and white text on a coloured background. 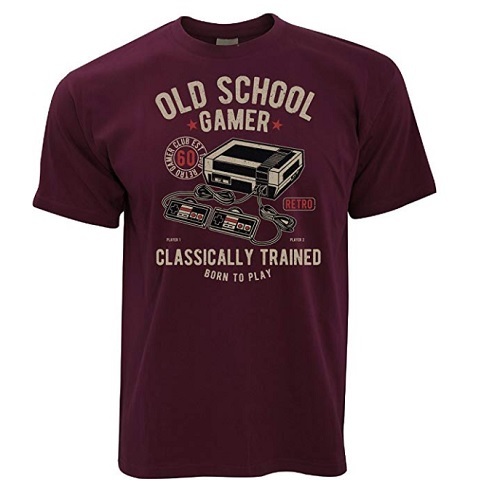 A T-shirt targeted towards the retro gaming community – available in several deep colours and contains an image of a console and the words “old school gamer, classically trained, born to play”. One for physics lovers, this coloured T-shirt is made from cotton and displays the words “this t-shirt happily existed in all possible states until you observed it. Now it has collapsed into a single state”. A great gift for anyone that spends too much time online. 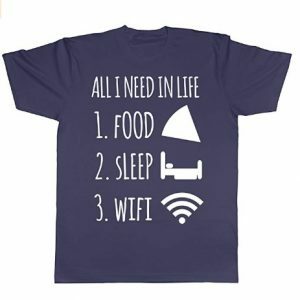 This T-shirt contains all you need in life; food, sleep and of course wi-fi. Available in several colours and sizes. The team here at Gifted Geek really enjoyed sourcing these science, tech and geeky t-shirts..
With so many t-shirts to choose from, we don’t think you’ll have any problems making your friends, family members and colleagues smile with one of these gifts. 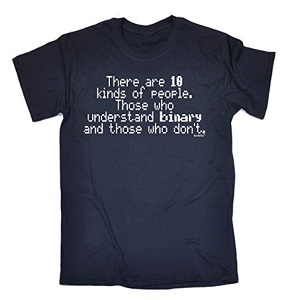 If you have a suggestion, perhaps an awesome geeky t-shirt that we’ve missed from our list, contact us here.